SIXTEEN YEARS AGO, Dan Chaon came out with a stunning, discomfiting debut collection of short stories called Fitting Ends. Its young narrators related wrenching tales of betrayal, violence, child abuse, and mental illness in oddly subdued, unadorned voices that gave the stories a peculiar, disorienting force. Luckless children and adolescents lurched from unwelcoming town to town, negligent household to household, deadly accident to accident. Yet the author’s emotional penetration, sympathy, and stealthy sense of humor, made reading about these tormented lives a rare and rewarding pleasure. In his subsequent three books, another collection, Among the Missing, and two novels, the dismal, compelling You Remind Me of Me and the grisly, repellent Await Your Reply, Chaon established himself as America’s pre-eminent Anti-Resilience-Of-The-Human-Spirit literary provocateur, a laudable and necessary role. Chaon’s characters may persist; they may endure; but, refreshingly, they do not prevail. Now, in his most recent collection, he retains his title: the traumatized adolescents and children who flounder through his earlier stories are back, considerably older and not a whit wiser. 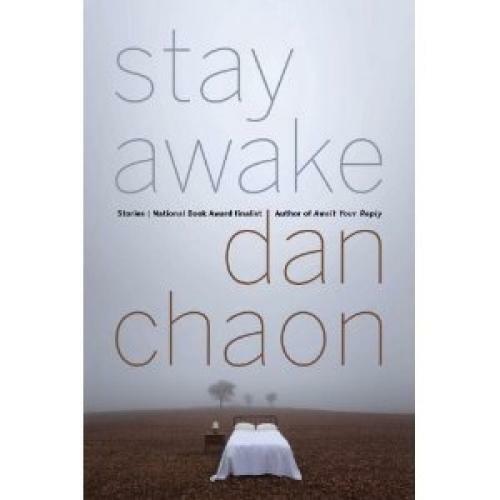 In Stay Awake, Chaon’s people have somehow reached middle-age but are still somnambulists stumbling through the after-effects of often unthinkable disaster. Pursued by half-remembered terrors, paralyzed by baffled rage, haunted by inarticulate yearning, they remain emotionally deformed, unfinished creatures. In “I Wake Up,” twenty-five-year-old Robert has adjourned to the bedroom above his adoptive parents’ garage as well as to a misty non-sequential interior world in order to avoid his own horrific act of origin, the murder of two of her children by his biological mother. “I had never been a very good rememberer,” he says in the matter-of-fact, clueless, sad locution of most of Chaon’s male characters. The story begins like a folktale: “Twenty years passed.” And now his eldest half-sister, one of his mother’s eight children (“We all had different dads. All of us were living with her when LaChandra and Nicholas were killed.”) calls him on the phone nightly and revives his slumbering memories. Cassie, like many of the women in the book, employs her own impoverished language—all cliché and psychobabble—to endure: “‘Only connect, Robbie,’ she said to me from time to time. ‘That’s what I firmly believe. Only connect.’” For Robert, this sisterly connection leads ultimately to an appalling epiphany. Chaon’s preoccupations—identity, adoption, families shattered by drug addiction, alcoholism, suicide, child-murder—have quickened rather than expanded. And he has simultaneously narrowed his literary strategy. His edgy, spooky stories have turned the corner into the frankly uncanny. Many of these stories have shifted from the metaphorical to the literal—while an early Chaon character might feel a kind of doubleness, a vague sense of living alongside another version of himself, in the title story of this latest collection a girl is born with two heads. Chaon’s people have always experienced the world as sinister and spirit-crammed. In Stay Awake, these perceptions, these symptoms, seem less like pathology and more like an accurate assessment. In short, Dan Chaon has—along with Colson Whitehead, Justin Cronin, Lev Grossman, and others—crossed over into genre, literary couture’s new black. (It is not the first time; most reviewers considered his second novel, Await Your Reply, a thriller.) But unlike his trendy peers, Chaon can really wear this suit. Horror, to alter the metaphor, fits him like a glove. Skip the zombies and the vampires. If literary writing is the A-side and genre is the B-side (a contentious “if” these days), then Chaon’s walk on the B-side is every bit as bracing as his earlier outings. Accompany him, if you dare. Alec Solomita is a fiction writer and critic based in the Boston area.